I really did plan on resting on my first couple of days back in Singapore. But as you can see, just after the first day, I was bored out of my mind. I didn’t have plans today as well, so I thought I joined my brother and his family at their hotel for an afternoon at the pool. It was great to get to spend time with my family. The pool’s not too shabby either. After swimming comes the highlight of the day. Before I left, I asked friends who’ve been to Singapore if they had Jollibee there, a Filipino fast food restaurant that is McDonald’s stiffest competition in the Philippines. Almost all of them replied that there is no Jollibee, but there is Jolly-V. I was really interested in trying out this stall, specially since everybody agrees that it does taste like the original Chicken Joy served in Jollibee. We rode the train to the Raffles Place MRT station and walked for about 5 minutes to the Lau Pa Sat Festival Market. This is the loveliest eating venue in Singapore, with its high ceilings and beautiful architecture. The stalls in this market feature local favorites, as well as cuisines from all over the world, hence Happy-V (as Jolly-V is now branded), and Mang Kiko’s Lechon. Happy-V serves almost the same food as Jollibee, but of course, with a lot less variety. They had the chicken, the Pinoy-style spaghetti and even palabok. 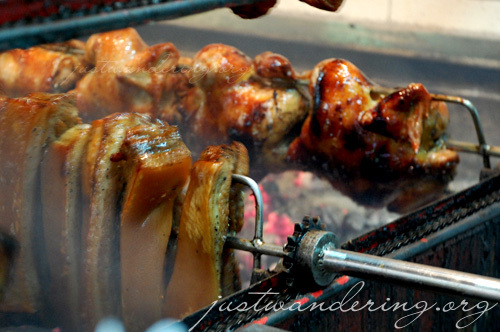 Mang Kiko’s Lechon has the same spit-style rotisserie grill commonly found in lechon manok (roast chicken) stores in the Philippines. You’ll see whole chicken and thick slabs of liempo (pork belly) turning round and round over hot charcoal. It was a sight to behold. They also serve lechon baboy (roasted pig) but it wasn’t cooked yet, so we settled for liempo and lechon manok. It was so good eating those meat with rice. Of course, the ones back in the Philippines are still the best, but given the circumstances, these are a real treat. There are sauces available like sarsa/gravy, soy sauce and vinegar. 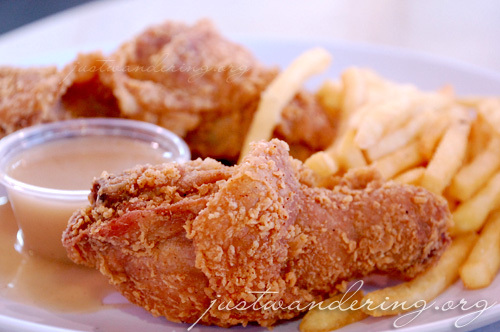 From Happy-V, we sampled the fried chicken, and omg, it is like Jollibee! It was so so good. The entire dinner was bliss. We walked off all that sinful liempo by walking around Chinatown, even checking out the shops at China Square Central. We boarded the MRT in Chinatown, got off at Clarke Quay to check out the new mall by the river. 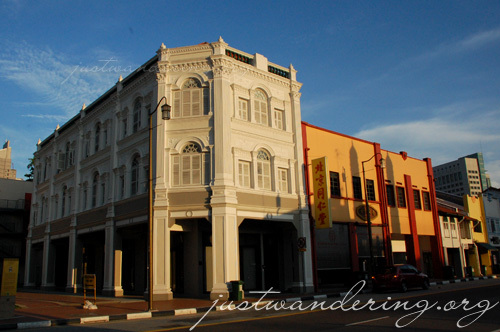 As we were walking around, I kept on seeing places that I’ve been to, and realizing just how small Singapore really is. But as small as the island is, I also realize that there are still plenty of places I’ve yet to visit. So for the last three days of my 30-day backpacking trip, that’s what I’m going to do. Hi Nina! 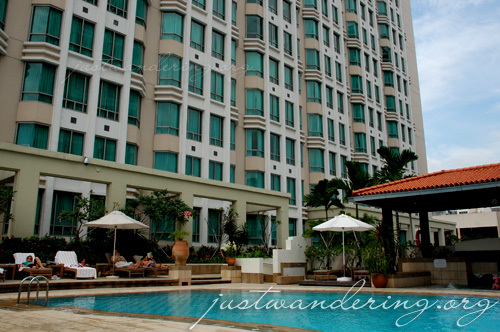 What hotel is that? It looks very nice and elegant. And another thing, the foods look very yummy! Nakakagutom!!! I love fried chicken and that fried chicken picture you have looks super yummy. Unfortunately, I can’t say I’ve had Jollibee chicken recently. I don’t really remember having it the last time I visited the Philippines…eons ago. I do remember the peach-mango pie. I would totally have that over apple pie any day. There is a Jollibee in California that I’ve driven past a few times now, but still have not tried. That picture is making me wanna try it now. WoooooOOOw!!!!!!!!!! !makabili nga ng fried chicken.